NES Buzz and Waldog (USA) in 15:42.58 by goofydylan8. Created by an Asian pirate developer, Koko Adventure was released in Korea in 1993. The game was planned to be released unlicensed in America as Buzz and Waldog, but was cancelled before it could hit store shelves. 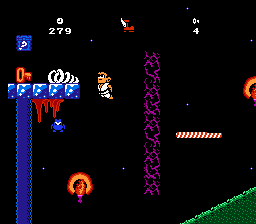 The game's pirate origins are obviously visible - many of the graphics are ripped from popular games like Super Mario Bros. and Sonic the Hedgehog, and the sound effects are borrowed from Tiny Toon Adventures. This is the author's second submission of this game, and improves on the previous one by skipping intermission screens faster.